Es una película sobre la vida de los bailarines legendarios de tango, María Nieves Rego y Juan Carlos Copes. Ellos ya habian separado cuando empecé a tener interés en el baile, así que no los he visto en el tiempo. La película me enseñó cómo ellos llegaron a ser los legendarios del baile de tango. Me parece que María sigue caminando con mucho orgullo como artista, pero con sentido de tristeza tambien. 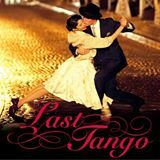 Our Last Tango is a movie about legendary tango dance couple, Maria Nieves Rego and Juan Carlos Copes. They are considered to be the pioneers of tango dace to show. They danced together since their teens into 60s until they were separated in 1997. By the time I got interested in dancing tango, they were in their separate ways, so I've only seen them in archive videos. Copes starred in the 1998 movie Tango which I saw, not knowing much about his history with Maria. It was quite interesting to learn about their career, love and hatred through this latest movie. The phrase goes, "it takes two to tango." So, it canot be easy for Maria to move on by herself. I give her biggest applause, and I'm sure many of my friends who dance without fixed partners feel encouraged by her words.